The largest of the Balearic isles is a winner amongst Scots looking for sun, sea and a failsafe summer holiday. Good beaches, plentiful resorts and fine climate drive high passengers numbers, as do direct flights from Glasgow and Edinburgh and package deals out of Aberdeen. Resorts such as Palma Nova keep it rowdy for younger holidaymakers, but the medieval cobbled streets of the nearby capital Palma add culture and history, too. Northwards is Port de Pollenca, stacked with families looking for shallow paddling waters by day and good restaurants at night. Around 158,000 passengers flew to Palma from Edinburgh last year with a further 230,000 jetting out of Glasgow, where up to four flights a day leave in the summer. Aberdeen Airport said Palma was one of its most popular routes, with holiday firm Thomson leading package deals from the North East. The Big Apple is a growing favourite for Scots, with just over a quarter of a million passengers flying last year to one of the greatest cities in the world. More than 110,000 passengers flew direct from Glasgow Airport to Newark with United Airlines, a service that runs daily in the summer. From Edinburgh, a further 144,000 made the direct trip with the twice daily United Airlines service to Newark and the daily flight to JKF operated by American Airlines. A new Delta Virgin service from Edinburgh to JFK is due to start at the end of May. From world-class shopping, dining, museums and its unmistakeable skyline, there is nowhere else like New York. Dubbed Tan-a-rife, the jewel of the Canary Isles offers almost year-round sunshine and plenty of nightlife, making it a firm favourite with Scots on the move. Playa de las Americas, built in the 1960s, is the most famous of the holiday towns on this volcanic island, with guests returning year-after-year. Not far away on the south coast is Costa Adeje, which is making a name for itself as a more upmarket neighbour with five-star hotels, designer shopping and waterfront restaurant. More than 250,000 passengers left Glasgow Airport for Tenerife last year, with four flights a day in the summer. In addition, 141,000 made the trip from Edinburgh. A direct flight from Aberdeen to Gran Canaria is to be introduced this summer. The original pleasure palace of Orlando is home to more than a dozen theme parks, including Walt Disney World and Universal Studios. Its enduring popularity now sees three travel firms offering flights out of Glasgow. More than 100,000 passengers made the trip from the west of Scotland to the sunshine state of Florida last year, with Virgin Atlantic taking a jumbo jet on the route over the summer months. Package deals from Glasgow are also offered by Thomas Cook Airlines and Thomson. Figures from Edinburgh Airport also show that Orlando is its most popular unserved destination, with passengers starting in Edinburgh but transferring before the final leg to Florida. More flights from Edinburgh Airport saw passenger numbers rise more than 50 per cent to 162,500 last year, making the Spanish capital one of its most popular destinations. It’s a true treat of a long weekend with its fine restaurants, cheap Rioja and impressive urban spaces with museums including Del Prado, Reina Sofia and Thyssen holding the best collection of Spanish art you’ll see in one city. The Catalonian capital is endlessly magnetic with its architecture, culture, tapas joints, bars and beaches just a short flight from Scotland. Its a city that is both laid back and forward thinking – last year, almost 122,000 people departed from the Scottish capital to sample its charms. Flights to Girona Airport - around an hour north from the city - are also available from Prestwick. Barcelona is popular throughout the summer, but is a particular favourite with young people thanks to its world class music festivals, including Primavera and Sonar. Another Spanish destination firmly on many Scots’ radar is Malaga, one of the main airports on the south coast which allows travellers easy access to the bustling resorts of Costa del Sol and the inland delights of Andalucia. Malaga itself is picturesque, but a train north to destinations such as Granada and Cordoba offers a more expansive picture of the Spanish mainland. Almost 150,000 Scots made the trip out of Edinburgh Airport last year. Almost 541,000 people flew from Edinburgh to Dublin, with the airport there rapidly expanding as a transfer hub for Transatlantic travel. 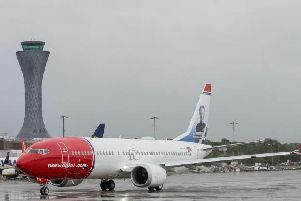 More than one million people stopped off in Dublin last year before connecting to another flight, with Los Angeles and Newark amongst the most popular. There was a 13.5 per cent rise in passengers flying from Edinburgh to Dublin last year, with the city remaining a popular tourist destination within its own right. Schipol Airport is one of the world’s largest, with onward flights to Asia and South America. But many are of course drawn to the Dutch city for its mix of quaint canals and townhouses, world-class art galleries and hedonistic underbelly.